New VIP Member Exclusive - Get 20% Off Your First Item. We group the collection of user information into two categories: personal, which is information identifiable to a specific member, and aggregate, which is general demographic information that does not identify any individual member. Personal information may include your name, email address, mailing address, credit card information and phone number. We may also collect certain demographic information such as your Site preferences, sizes, age, gender, geographical location, language, time zone, income and education (some of the information we ask for may be optional). JustFab may use or disclose aggregate information for any purpose. We also receive and store certain personally non-identifiable information, which is collected passively using various technologies, and cannot presently be used to specifically identify you. This Site may use such information and pool it with other information to track, for example, the total number of visitors to our Site, the number of visitors to each page of our Site, the domain names of our visitors' Internet service providers, and how our users use and interact with the Services. Also, in an ongoing effort to better understand and serve you, we often conduct research on customer demographics, interests and behavior based on the personal and other information provided to us. This research may be compiled and analyzed on an aggregate basis. We may share this non-identifiable and aggregate data with affiliates, agents and business partners, but this type of non-identifiable and aggregate information does not identify you personally. We may also disclose aggregated user statistics in order to describe our Services to current and prospective business partners, and to other third parties for other lawful purposes. We may share information about you with trusted third parties in order to improve your customer experience. These third parties may contact you about products, services or promotions you may be interested in, or to otherwise improve your customer experience with this Site. We may share information about you, such as your name, address, email address, as well as a record of any transactions you conduct on our website or offline with us via our third-party advertising partners and its service providers, in order to deliver to you banner advertisements and other advertising tailored to your interests when you visit certain websites. Our advertising partners will make the data we provide to it anonymous. To learn more about the use of this information or to make choices about receiving personalized advertising provided by third parties, please visit the Network Advertising Initiative by clicking here. When we believe in good faith that disclosure is necessary to protect the rights, property and safety of JustFab, its users or the public. We may occasionally send you newsletters and emails regarding special offers, promotions, features and/or product updates. We may also communicate with you on behalf of third parties about special offers, promotions, features and/or product updates we think may be of interest to you, or you may have opted-in to receive newsletters or special promotions from one of our trusted third party providers. If you decide you do not wish to receive these communications, you may opt-out by clicking the unsubscribe link or by following the instructions included in the communication. Note however that as user of the Services you cannot opt-out of some administrative communications that are reasonably necessary to the Services, such as billing or service notifications. You may also opt-out of certain targeted advertising by visiting http://www.networkadvertising.org/choices or http://www.aboutads.info/choices. If you are a California resident and have an established business relationship with us, you can request a notice disclosing the categories of personal information we have shared with third parties, for the third parties' direct marketing purposes, during the preceding calendar year. To request a notice, please submit your request to TechStyle, Inc. (f/k/a Just Fabulous, Inc.), Attn: Legal Department, California Shine the Light Inquiry, 800 Apollo Drive, El Segundo, CA 90245. The following personal data may be collected from EU customers: your name, email address, mailing address, and IP address are collected. This personal data is used for the following purposes: marketing and sales, internal research, and compliance with federal, state and local laws and regulations. JustFab also collects aggregate data such as your Site preferences, sizes, age, gender, geographical location, language, time zone, income and education. This aggregate data is used for the following purposes: marketing and sales activities, to optimize shopping experience and types of goods sold, internal research, partnerships or agreements with affiliates, agents and business partners, and to describe our Services to current and prospective business partners. ShoeDazzle.com, Inc. (d/b/a ShoeDazzle) collects the following types of personal data: name, email address, mailing address, credit card information, phone number and IP address. The following aggregate data may also be collected: Site preferences, age, gender, geographical location, language, time zone, income and education. Fabletics LLC (d/b/a Fabletics and FL2) collects the following types of personal data: name, email address, mailing address, credit card information, phone number and IP address. The following aggregate data may also be collected: Site preferences, age, gender, geographical location, language, time zone, income and education. Personal Retailing, Inc. (d/b/a FabKids) collects the following types of personal data: name, email address, mailing address, credit card information, phone number and IP address. The following aggregate data may also be collected: Site preferences, age, gender, geographical location, language, time zone, income and education. JustFab may disclose personal and non-personally identifiable aggregate data with affiliates, subsidiaries, business partners, advertisers and vendors. The purpose for disclosure to affiliates, subsidiaries and business partners is to improve customer experience, for internal research and marketing and sales purposes. We may share information with advertisers and vendors to comply with lawful agreements and for advertising purposes. JustFab retains potential liability in cases of onward transfer of information to third parties. JustFab may also be required to disclose personal information in response to a lawful request by public authorities, including to meet national security or law enforcement requirements. 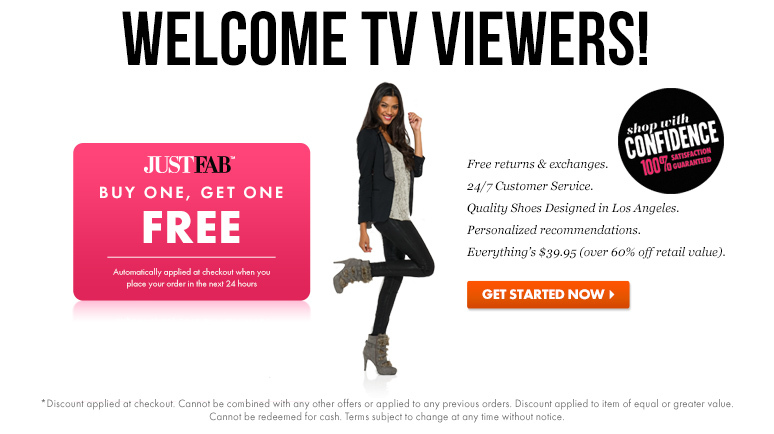 You have the right to access, correct or delete personal data which has been provided to JustFab. At any time, you may update or correct your online account information by logging into your account and navigating to the "My Account" page or by contacting us. You may also delete your personal data by contacting us to deactivate your account, but note that we may retain certain information as required by law or for legitimate business purposes. We may also retain cached or archived copies of information about you for a certain period of time. If you do not want JustFab to use or disclose your information or provide your information to third parties for marketing and sales purposes, please contact JustFab at the address provided below under "Inquiries or Complaints Regarding the EU-US Privacy Shield Program". If you have already received a non-administrative communication that you did not wish to receive, you may opt-out by clicking the unsubscribe link or by following the instructions included in the communication. JustFab has further committed to refer unresolved privacy complaints under the EU-US Privacy Shield Principles BBB EU PRIVACY SHIELD, a non-profit alternative dispute resolution provider located in the United States and operated by the Council of Better Business Bureaus. If you do not receive timely acknowledgment of your complaint, or if your complaint is not satisfactorily addressed, please visit www.bbb.org/EU-privacy-shield/for-eu-consumers/ for more information and to file a complaint. There is no charge to consumers for calling or using this independent dispute resolution mechanism. Under certain limited conditions, European Union individuals may be able to invoke binding arbitration before the Privacy Shield Panel to be created by the U.S. Department of Commerce and the European Commission. JustFab is subject to the jurisdiction and investigatory and enforcement powers of the Federal Trade Commission (FTC).